West Coast ramen bar franchise Jinya will open its first Southeast location in April in Sandy Springs. 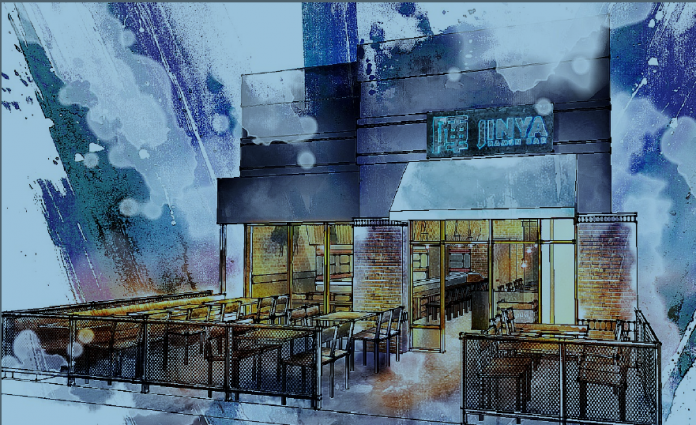 Located at 5975 Roswell Road, Jinya will be helmed by chef Yao Liu, formerly of Umi. The Japanese restaurant, which has 14 locations from New York to Tokyo, is known primarily for its tonkatsu ramen, made by cooking pork bones for 10 hours, along with dashi and dried fish. With 14 rotating ramens and about 10 available at any given time, there will be chicken-based varieties and vegetarian and vegan options as well. Open for lunch and dinner daily, Jinya will accept reservations during the week but not on weekends. Though the ramen bowls are large, the rest of the dishes are served tapas-style. “In Asian culture, we serve family style so everyone can share,” Mei says, noting that the appetizers can feed two. Aside from ramen, offerings include crispy fried chicken, Tokyo curry rice, kale lollipops, gyoza dumplings, Brussels sprout tempura, and, for dessert, mocha ice cream and tofu almond jelly. There will be Japanese beer and wine, plus sake, soju, and green tea, but no cocktails. The 1,700-square-foot space will seat 30 inside and 20 on the patio. Expect high ceilings, an open kitchen, and a large communal table in the center of the dining room.